JUNO BEACH, Fla. – NextEra Energy Resources, LLC, the competitive energy subsidiary of NextEra Energy, Inc. (NYSE: NEE), today announced that one of its subsidiaries has completed the sale of its ownership interest in its Marcus Hook generating assets to an investment affiliate of Starwood Energy Group Global, LLC, an energy infrastructure investment firm that specializes in value-add power generation, transmission and storage energy projects. The total consideration paid is approximately $765 million, including estimated working capital, subject to customary closing adjustments. In the fourth quarter of 2016, NextEra Energy Resources expects the sale to result in net proceeds of approximately $260 million and a gain on disposition, which will be excluded from adjusted earnings. 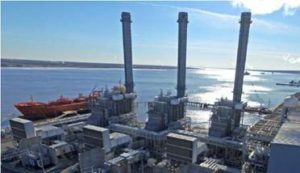 The transaction includes the 790-megawatt (MW) combined-cycle Marcus Hook Energy Center and the 50-MW simple-cycle Marcus Hook 50 Energy Center. Both of these facilities are natural gas-fired power plants located primarily in Marcus Hook, Pa.
NextEra Energy Resources, LLC (together with its affiliated entities, “NextEra Energy Resources”), is a clean energy leader and is one of the largest wholesale generators of electric power in the U.S., with approximately 18,260 megawatts of generating capacity, which includes megawatts associated with noncontrolling interests related to NextEra Energy Partners, LP (NYSE: NEP), primarily in 25 states and Canada as of April 2016. NextEra Energy Resources, together with its affiliated entities, is the world’s largest generator of renewable energy from the wind and sun. The business operates clean, emissions-free nuclear power generation facilities in New Hampshire, Iowa and Wisconsin as part of the NextEra Energy nuclear fleet, which is one of the largest in the United States. NextEra Energy Resources, LLC is a subsidiary of Juno Beach, Fla.-based NextEra Energy, Inc. (NYSE: NEE). For more information, visit www.NextEraEnergyResources.com.